A teacher battling breast cancer didn't know it, but she was in for a big surprise on the day she finished chemotherapy. 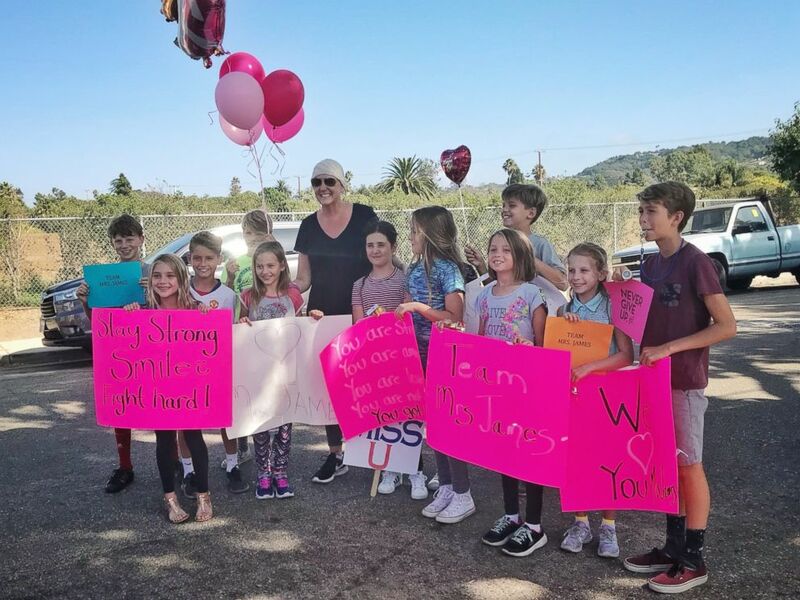 When Katherine James of Santa Barbara, California, arrived home from her final treatment last week, she was met by a mob of kids who offered her hugs and applause. "My mother was driving and I remember saying, 'Mom, I think those are kids from my class standing outside of my house," said James, a fourth-grade teacher at Mountain View Elementary School in California. "Their little faces were really happy. I'm extremely grateful for all their love and support." 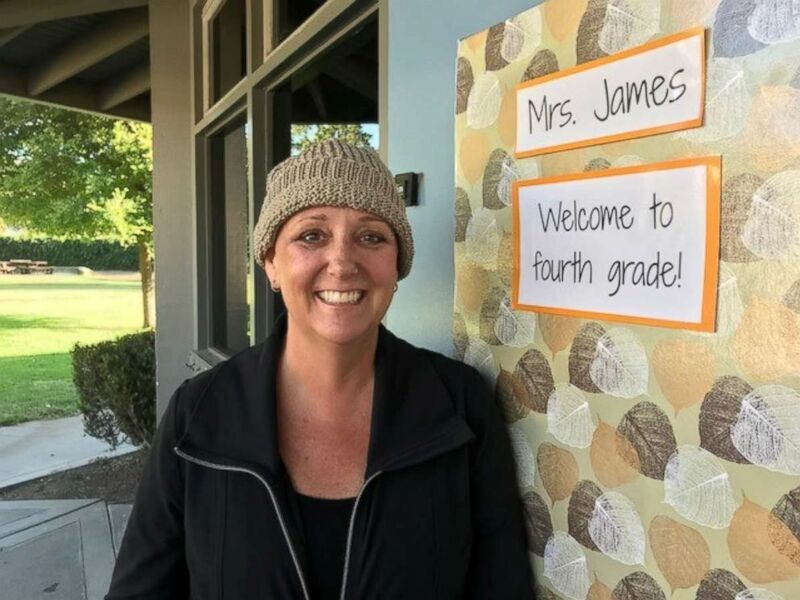 Students of Mountain View Elementary School in California, surprised their fourth grade teacher, Katherine James, on the final day of her chemotherapy treatment. James, 50, has been at Mountain View for 23 years teaching third and fourth grade. But a few weeks before the 2017-2018 school year ended, she was diagnosed with Stage 3 breast cancer. "You never want to hear those words and then a doctor is sitting in front of you saying them," James said. "It sends you on a path that you never imagined being on. You start fighting right away. You want it to go away." James immediately had a double mastectomy and began chemo. On Sept. 11, she finished the last of four rounds. Later that day, James arrived home to a slew of former and current students holding inspirational signs, flowers and balloons. Mom Brigitte Welty, told "GMA" that James previously taught her son Ashton, who is now 16. Welty decided to organize James' homecoming after speaking with her sister, who is also battling breast cancer. Welty learned that ringing bells traditionally signifies a patient has completed chemo, so she wanted to do that for James. Katherine James, of Santa Barbara, California, completed chemotherapy on Sept. 11, 2018. "She was just speechless," Welty said. "She came out with the biggest smile. She was really touched." Ivana Firestone, mom of Brooks, 9, and Anja, 7, said her son had James as a teacher for both third and fourth grade. "She's just so engaged and fun and present — you know that she loves her job," Firestone told "GMA." "We are here to support her in any way that she needs. We are hoping she gets back to school, but we want her to take as much time as she needs." 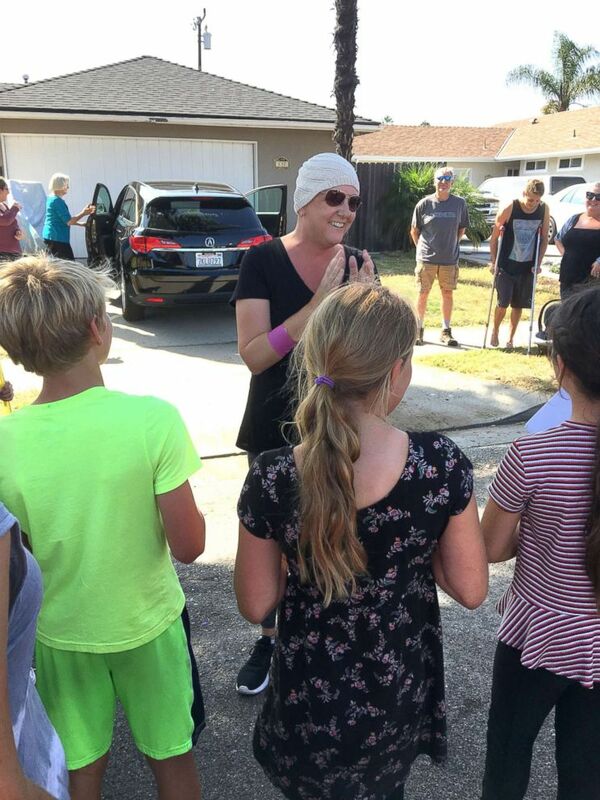 Katherine James was surprised by a mob of students at her home on the last day she underwent chemotherapy. Jolee Tappeiner, a student of James' released a statement to "GMA": "When I first found out Mrs. James had cancer, I was sad and worried about her being able to fight it. But when I saw her at her house, I could see how strong she is and I know she will be coming back to school even stronger!" James said she is feeling the love from her community and hopes to return to the classroom.